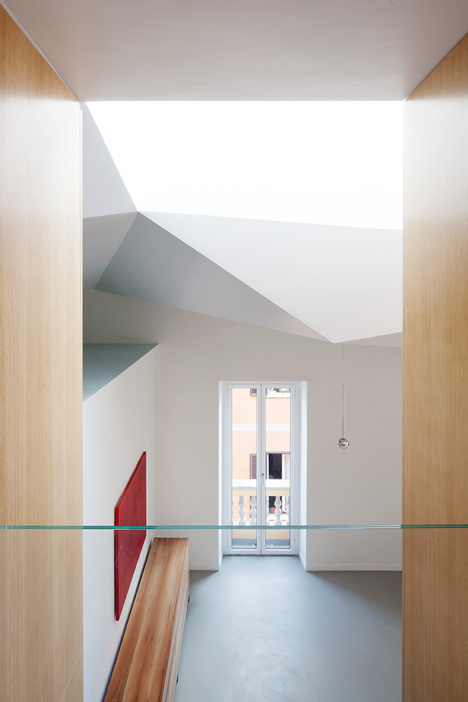 Italian architects Scape have modernised an apartment in one of Rome's oldest neighbourhoods by adding faceted ceilings and a boxy wooden staircase. The residence occupies the uppermost floors of a late nineteenth-century detached house on Oppian Hill - one of the seven hills that forms the historic centre of the Italian capital city - and is positioned just east of the Colosseum. Scape were tasked with rationalising an incongruous interior created by numerous extensions and renovations, but were bound by strict planning laws governing the historic architectural fabric. "Not only was it a situation that was functionally and spatially compromised, but added to this were the difficulties related to intervening architecturally in a city where the law tends to protect pre-existing elements that are easier to control, thus unfortunately often ignoring aspects of quality that might be improved upon," they explained. The interior is arranged around a double-height living room, above which the architects have installed a system of suspended ceilings with angular facets, intended to emphasise the joints of the roof. "The objective of the project was that of reconstructing the interior of the dwelling to produce a spatially coherent and unified entity while taking advantage of and enhancing aspects of the house," added the architects. A separate kitchen and dining room is also located on this main floor, alongside a pair of bedrooms with en suite bathrooms. New wooden storage closets have been added along the walls and match up with the wooden staircase that ascends to a guest bedroom on the mezzanine floor, as well as to a smaller level above. Located in the building's turret, this top floor now functions as a study room and opens out to rooftop balconies on two sides. The transformation of the two top floors of a freestanding house in Colle Oppio is a project that, as is often the case working with the ancient fabric of Rome, involved numerous complex factors. The apartment, measuring a little over 200 msq, was distributed over three levels; two main floors and a mezzanine, the fruit of numerous interventions that had been carried out in a disorderly and incoherent manner over the last twenty years. Not only was it a situation that was functionally and spatially compromised, but added to this were the difficulties related to intervening architecturally in a city where the law tends to protect pre-existing elements that are easier to control, thus unfortunately often ignoring aspects of quality that might be improved upon. Finally, the building had static problems that forced the owners to carry out a considerable consolidation of the floor slabs and roofing. The objective of the project was that of reconstructing the interior of the dwelling to produce a spatially coherent and unified entity while taking advantage of and enhancing aspects of the house such as the high ceilings in certain areas and the presence of several outside spaces, which, although small, are on different levels and provide splendid views of the city. Two main structural operations dictated the organisation of the various areas of the house: integrating a large body of wood for the internal staircase to connect the various levels and all the cupboard and storage space necessary for the easy running of a house, as well as the homogenisation of the ceilings that were arranged with layered roofing that was interesting but compromised by irrational and disorganised load-bearing elements. The first operation allowed the redistribution of the various living spaces in the house. 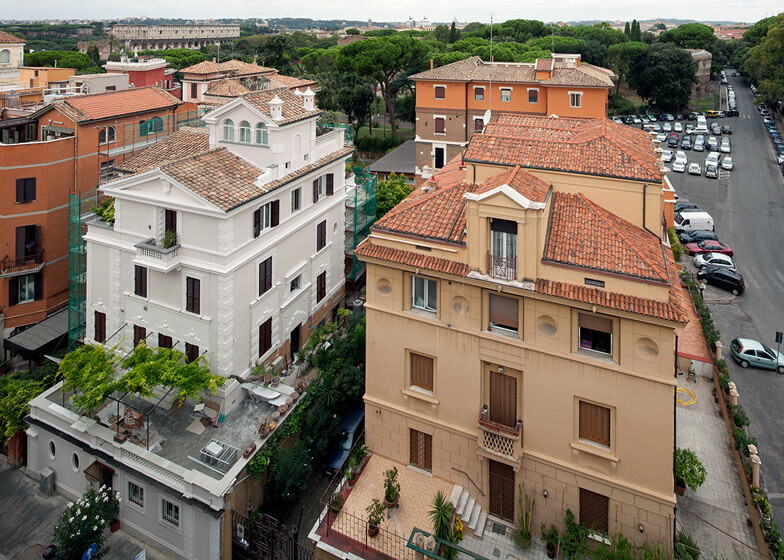 On the first floor, the living room takes advantage of the building's high ceilings and the best views of Colle Oppio. The sleeping quarters on the other hand are smaller spaces: two bedrooms with their respective bathrooms. Large four-metre high cupboards introduce a connecting element between these two areas of the apartment. The new positioning of the staircase presented the possibility of introducing visual interaction between the various levels. The mezzanine, which comprises a small area dedicated to the ironing, the guest bedroom and the boiler room, faces onto the living room on one side and the kitchen on the other, bringing to the fore qualities of height and shape in the spaces. On the top floor, the landing at the top of the stairs links the two upper terraces, one on each side, and the splendid altana or large turret room that will be used as a study. The second considerable alteration involved the roofing. A new system of false ceilings accentuates the articulation of the joints in the roof, highlighting the movement and interaction with the spaces beneath. It was an intervention inspired by the existing shapes of the roof while strengthening and reinforcing those shapes in a contemporary way.